2.) In order for something to be Illusory, it is necessary that it appear as true, only to afterwards undergo a change such that its appearance moves from truth into untruth. 3.) Motion is therefore not --as it first appeared to be --simply illusory, but is an essential part of the truth, since the truth about illusion itself is dependent on motion. Like every fortune cookie, it is the message inside --in this case the inner movement --that counts. Whether that message comprehends even the future is a question worth leaving on the table. Amusing, but where does Hegel say motion is illusory? according to hegelian dialectics, stasis is illusory--Hegel wants to suggest reality is dynamic, a process of becoming...motion is not a thing in itself--rather, objects move (really Hegel was close to Aristotle, however quaint...) ..there's a long section in the Logic about motion. I don't think Hegel is a Zeno, nor a platonic skeptic about external reality...au contraire, the dialectical method reveals thought at work in the world, as a movement of contradictions-- (tho'...analytically speaking, I think Hegel generally meant a qualitative contradiction--ie contrasting forces, in brief--, not a strict A or not A sort....). I am really working on how to respond with brevity without sacrificing sufficiency. So here goes. "Amusing, but where does Hegel say motion is illusory?" Keep in mind I am not claiming above that Hegel simply says that motion is illusory, but that the initial appearance of motion is illusory. This is because motion as becoming, while offering, in distinction from being and nothing, the first concrete concept, is nevertheless not conceived concretely at first (cf. Hegel's wissenschaft der logik as well as his lectures onthe presocratics--especially Heracleitus). If motion is to be concretely conceived, then the concept of motion must include within itself the necessity of changing into the motion of the concept (Begriff); the concrete conception of motion must include within it the manner in which all motion has its ultimate 'telos' in this concept which comes to comprehend it. Thus the concept itself moves. 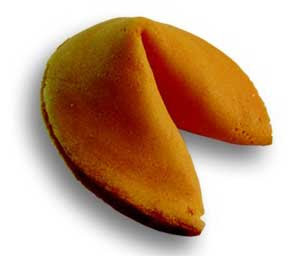 So to come back to my fortune cookie, and your objection that, for Hegel, it is instead the case that "stasis is illusory", I respond that the binary opposition of kinesis/stasis is insufficient and depends upon abstract conceptions. Stasis and Motion are here illusory. But this opposition is itself comprehended by what is self-moving (bewegen sich). And this self-moving concept is the concrete concept of motion itself. This sublated concept of becoming is inherently constituted by the movement by which motion moves from illusion into truth. Now if you consider that motion, according to its logical truth, is contradiction, then it should be all the more obvious that the truth of contradiction which is preserved in the third moment of Hegelian dialectic is one in which contradiction is RECONCILED, and is therefore inclusive of the prior moment in which contradiction --since it is initially grasped in a merely abstract manner (what you call "strict A and not A") --is understood as illusory. I would agree that Hegel's system implies the abstractions, and concepts (including contradiction, and the threefold movement--being/not-being/becoming) precede the event, in brief. I did not say otherwise...yet supposedly they are realized..in matter itself are they not. your reading sounds fairly orthodox...Hegel does sounds like Zeno insofar that the motion--ie. change-- is contradictory--therefore illusory to Zeno. So where does Hegel differ? I suppose it's the becoming process itself, which relates to...finitude (ie, a definite sum between archer and target), which is completed by the arrow striking the target, but this is murky to me. Scanning some old chestnuts in the Logic I note his distinctions between immanent measure and external motion (which seems to be mechanics, more or less, or efficient cause)...really, he's opposed to a mere mechanical reading...yet I suggest, as does Russell (who has an interesting discussion re Zeno's paradoxes in Principles of Mathematics), that Hegel, like Zeno had not yet applied the variable to the continuous function. It's contradictory, that is if the motion of the arrow towards target is divided up discretely (ie 1/2, 1/4, 1/8, etc)--yet at any time, it is finite, and just as importantly, a continuous function. The variable--ie, the arrow-- does not grow smaller..only the measuring numbers do, the quantities, which even the Hegelian admits are a priori ..ie mental, not the ding an sich...or something like that. Thanks for indicating so many promising directions by which to further proceed! I will refrain from responding to your third paragraph, since it merits a careful reading of Russel on my part, an investment which I am enticed to make in the near future. "...yet supposedly they are realized..in matter itself are they not"? I read the subject of your question ("they") to be the "abstractions" which you acknowledge Hegel's system "implies", as you put it. When you ask whether they are realized in matter I must clarify for myself what you might mean. Do you mean that these abstractions are previously instantiated in matter, i.e. that such abstraction is abstraction FROM some prior material reality? Or do you mean that these abstractions of thought, though they be initially abstract, are eventually to become realized in matter and made concrete? This clarification of your own intention aside however, I respond that above all Hegel's thought moves toward what is concrete from what is abstract and not the other way around. This must be understood in conjunction with the fact that the notion of a "material thing", an object that stands opposite a subject and is therefore "a known" that is understood as other than the knower, is abstract for Hegel. For this "known", as other than the knower, is mediated by knowing. Any concrete conception of the "known" must not fail to negelect such mediation. Concretion demands a unity, not a disparity, between conceptual form and conceptual content. Thus when we first conceive of becoming we have no doubt conceived of something the content of which is more concrete than either Being or non-Being. Nevertheless this naive conception of motion remains abstract insofar as it is, as a concept, static and antithetical to the motion of which it is a conception. Its form and its content are opposed. But this opposition in turn serves the starting point for the motion of the concept itself. And this latter motion culminates in a conception of motion that recognizes how all motion completes itself in this conception. The end toward which all motion tends is this concept of motion, and only in the end does motion become fully concrete. By contrast, when we first conceive of motion, our conception has not yet moved, and is therefore undeveloped and abstract. The alleged material starting point is itself an abstract conception. "Hegel does sounds like Zeno insofar that the motion--ie. change-- is contradictory--therefore illusory to Zeno. So where does Hegel differ? I suppose it's the becoming process itself, which relates to...finitude (ie, a definite sum between archer and target), which is completed by the arrow striking the target, but this is murky to me." So where DOES Hegel differ? This was, in fact, the entire point of my post above: for Hegel, the illusion of motion depends on the motion of illusion. But let me elaborate, instead of resting content with the employment a familiar turn of phrase that is increasingly subject to abuse in contemporary writing. If Zeno can be taken to uphold that motion is illusory (and for the purposes of the present discussion it matters not whether he actually upheld such a position), he nevertheless cannot be taken to ascribe this illusory character to the very essence (and truth) of motion. In other words, Zeno would differ from Hegel to the extent that he did not account for the NECESSITY of motion's illusory character. For our Zeno, presumably it is an accidental "given" that we encounter motion at all ---and the same can be said about the fact that this motion is, as fate would have it, illusory. Such illusion as Zeno's is understood only as an obstacle to knowledge; it is an unfortunate predicament of the knower, not something which is to be known. But for Hegel, an ultimate distinction between the two is necessarily spurious. The very illusion as such must come to be known...and in this process, this becoming or motion, it will become true. Do you mean that these abstractions are previously instantiated in matter, i.e. that such abstraction is abstraction FROM some prior material reality? Or do you mean that these abstractions of thought, though they be initially abstract, are eventually to become realized in matter and made concrete? The latter, Sir Pseud. Which is to say, Hegel's an Aristotelian, is he not (with quite a bit of added baggage, ie the dialectical process of World History). At the level of nature, however, isn't Hegel suggesting something..rather grand...like substance, form, efficient and final cause, etc. He at times seems to be objecting to shall we say a spinoza-istic sort of mechanism. The abstractions are ultimately Mind itself (or Absolute, the Idea); which ala Ari. 's Primum Mobile sort of decides, at some point in eternity, to instantiate itself (Himself?) in the matter which he created...(then those subtle potentia/actuality issues via Ari.). Or that's how I read Hegel's Logic, though not actually subscribing to his schema--we can't just sweep away the idealist elements--though there are differences--Hegel at times sounds opposed to the dualistic aspects of Aristotle (but I don't think Hegel's a platonic, or believes in a Gegenstande, etc)--the form (ie dialectical process) is embedded in matter, realizes it, if you will excuse some modernist jargon. So in a sense, the arrow--the something that undergoes motion (Hegel says motion itself a quality of matter, not existent in itself--does he not) hits the target, overcomes the endless regress of being/not-being (or infinite divisibility in mathematical terms) because the Idea has so ordained it--. At least, that's my attempt a metaphysical reading --tho' the math. people read Zeno in terms of the infinitesimal, and however vulgar little Lord Russell may be, his points on the variable and continuity seem rather spot on (tho'...a sophisticated scholastic would probably bring up something like Ari's causes, at least in regards to the physics...). A bit off-topic,Sir P., but what think you of the NYT's piece on Heidegger the nazi? Hirsch has a reputation for this sort of loud moralizing (to be brief)--note little or no discussion of any substantial points, even the sort of Heidegger-lite (ie, QCT...relation to other german phil. Hegel, Nietzsche, etc) that many of us nearly enjoy a few minutes each year. The "banality of evil" gal Arendt makes a predictable appearance (a rat, according to Hirsch-types). Heidegger-lite. Well said, J. Given the fact that no matter how you take him, Heidegger ist shwer (especially from the 1930's onward), I find the irony of such a phrase appropriate. Heidegger-lite is an unbearable lite-ness, perhaps. Ok. Enough of that. Its funny that you mention a consideration of Heidegger and the Nazi's, since this very morning I was deliberating over the possibility of (uncharacteristically) posting something on this question. But of course, this was not prompted by such thoughtless banter as Hirsch or Faye are all too eager to provide. Despite all the obstreperous commotion being made by people like Faye (and all the lesser journalists that want to ride in the current of his recent publication), it seems to me that the really enduring problem of Heidegger's Nazism is being sorely missed. Heidegger, despite private remarks and public exhortations made in the years of 1932-36 or so, was manifestly no ideologue. Even his crudest critics should have to acknowledge the superficial evidence that Heidegger's thought did not regard itself as capable of conforming to a previously laid out 'platform'. This was already clear in 1919, in the Kriegsnotsemester (see the excellent Iain Thomson on this matter), and even, at least arguably, in the earlier habilitationschift of 1915. But this observation, which only attends to the ideologue vs. non-ideologue debate that Faye wants to drag things down to, can easily tranquilize the attempt to inquire into the depths of Heidegger's relation to Nazism. The irony is that the issue is usually phrased as "the connection between Heidegger's thought and his politics". This is far too weak, not because Heidegger's thought was at the service of his politics (ideology), but because his 'politics' was entirely at the service of his thought (what might be called, in all its under-appreciated ambiguity, eu/ou/utopism). The main problem with the discussion is that rarely (Thomson is a great contemporary exception here) dose Heidegger's Nazism ever get considered as a problem not only OF his thought but FOR his thought. typo correction (I really wish comments could be edited): "Heidegger ist schwer"